There's a lot to look after when it comes to writing your resume. These tips can lend you a hand. To be a successful candidate for nanny jobs, your resume will require a bit of nurturing, says resume expert Kim Isaacs. 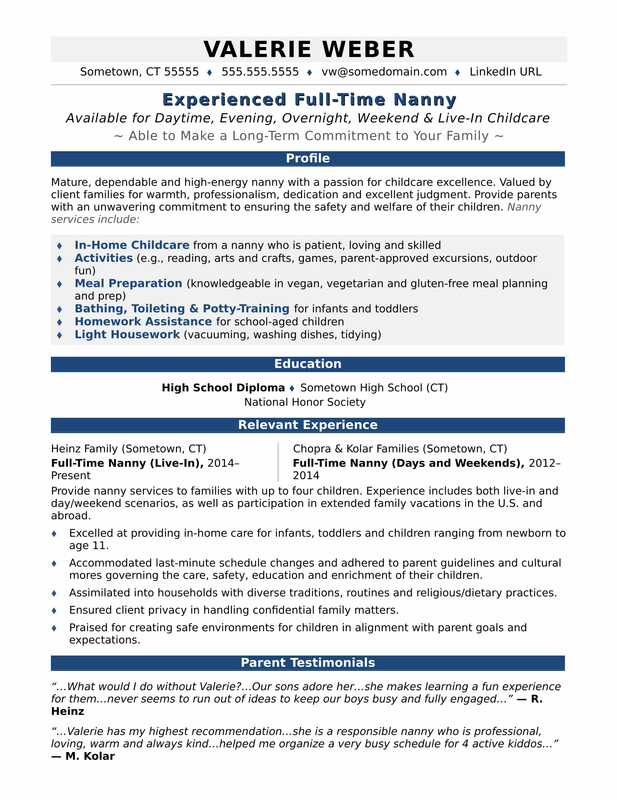 For pointers on rearing your resume with some TLC, view the sample resume for a nanny that Isaacs created below, or download the nanny resume template in Word. Jobs for nannies and other child care workers are projected to grow by 7% (or 84,300 jobs) from 2016 through 2026, according to the Bureau of Labor Statistics (BLS). Unsurprisingly, you'll find the highest level of employment for this job in the following populous states: California, Texas, New York, Florida, and Pennsylvania; and in the following metropolitan areas: New York City, Los Angeles, Washington D.C., Atlanta, and Chicago. As a nanny, you can expect to earn a median wage of $22,290 per year, or $10.72 per hour, according to the BLS. Additionally, you can learn about personal service careers and search for nanny jobs on Monster. Provide nanny services to families with up to four children. Experience includes both live-in and day/weekend scenarios, as well as participation in extended family vacations in the U.S. and abroad. Excelled at providing in-home care for infants, toddlers and children ranging from newborn to age 11. Accommodated last-minute schedule changes and adhered to parent guidelines and cultural mores governing the care, safety, education and enrichment of their children. Assimilated into households with diverse traditions, routines and religious/dietary practices. Ensured client privacy in handling confidential family matters. Praised for creating safe environments for children in alignment with parent goals and expectations. If you're looking to get hired as a nanny, your resume can't look like child's play—you need to take a professional approach if you hope to be seriously considered for the position. Could you use some help with that? Get a free resume evaluation today from the experts at Monster's Resume Writing Service. You'll get detailed feedback in two business days, including a review of your resume's appearance and content, and a prediction of a recruiter's first impression. The experts at Monster will take good care of your resume so that you can get the right job.